Less than a minute's walk from Tamade Station, Exit #5, on the Yotsubashi Subway Line. About a ten minute walk from Kishinosato-Tamade Station, Tamade Exit, on the Nankai Main Line. ●By the Hanshin Express Highway 15 Sakai Line, get off at the Tamade exit ramp, about 300 meters to the east on the left-hand side on Nanko Boulevard. 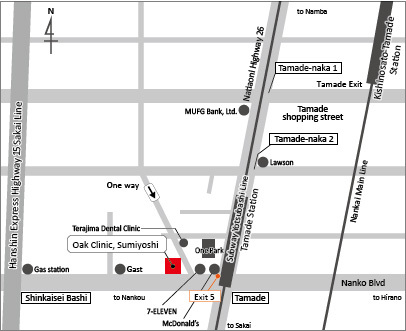 ●From Namba, take the National Highway 26 south and turn right at Tamade intersection, and it's on your right. ●From Sakai, take the National Highway 26 north and turn left at Tamade intersection, and it's on your right. You can park around the clinic. Please go to “One Park” on the South side of Kansai Urban Bank Tamade Branch. From Tamade intersection, please go north on National Highway 26 and turn left at the corner just before Kansai Urban Bank, and the parking is on your left-hand side. When you enter the parking you’ll receive a 3 hour ticket, so when you leave our clinic please tell reception when you check out.